I am pleased to bring to you the second part of the guest post by Shankey Agrawal on the implications of GST on the entertainment and media industry. 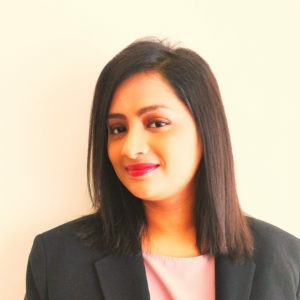 Shankey Agrawal is an advocate with over 9 years of experience in the field of Indirect Tax advisory and Litigation (before administrative and judicial fora). 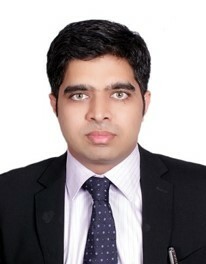 He has been associated with Deloitte as a retainer counsel since September 2017, providing Litigation Support including representational services as an advocate in Indirect Taxation. In an acquisition agreement, a studio acquires the film rights from a production house for e.g. exploitation rights, Intellectual Property (IP) Rights and derivative rights. As a consideration for these rights, the Studio agrees to make payment to the production house. The production house in turn engages talent, cast, crew etc. to produce the film. After the production of the film is complete, the studio by virtue of being the owner of the rights, distributes the same to theatres as well as digital platforms for e.g. Amazon, Netflix etc. Services provided by artists to Production House. Service provided by Production House to Studio by producing a film. Service provided by Studio to OTT platforms like Netflix and Amazon, cinema theatres, home video operators, satellite broadcasters, etc. by way of distribution of film exhibition rights and copyrights. At what point does GST liability of production house arise in film financing agreement specially in case of advance payment or payments in various instalments? Whether Input tax Credit is available to the production house and other parties respectively? It is to be noted that as per the provisions of GST, an invoice shall be issued within a period of thirty days from the date of the supply of service. GST provisions further presume that supply shall be deemed to have been made to the extent it is covered by the invoice or payment received by the supplier. Accordingly, GST provisions prescribe that GST liability will arise with each tranche of payment by the supplier i.e. studio to production house. This is irrespective of whether any service is completed or even the film production has even started. In other words, even advance payments are liable to GST levy. GST provisions assumes that service is provided as soon as the payment is made to the other party. This creates a cash flow issue for the industry as GST has to be paid in advance even before the actual provision of services. As per the GST provisions, an output service provider is entitled to avail Input tax credit of the input services received by it for provision of output services. For e.g. a studio will be entitled to avail Input tax credit of tax charged by production house at the time of payment. Lets say, Studio has sold the rights to Netflix for which GST liability is Rs. 10,00,000/-. The studio was charged Rs. 5,00,000/- GST by the production house for producing the film. At the time of payment of GST, Rs. 5,00,000/- will be set-off and the Studio will only be liable to pay GST of Rs. 5,00,000/- (i.e. 10,00,000 – 5,00,000). Similarly, production house is entitled to avail input tax credit on the amount of tax charged on the services by casts and crew members. Entire point of allowing credit of input tax is to avoid cascading effect i.e. imposing of tax on another tax component. In absence of Input tax credit, same studio would have paid Rs. 15,00,000/- as tax i.e. 10,00,000/- (on output services) + Rs. 5,00,000/- (on input services). Rate of tax on input and input services is higher than rate of output tax resulting in non-utilization of higher credits. This is referred to as “Inverted Tax Structure’ (explained in point (iii) below). Output supplies at a loss, resulting in non-utlisation of Input Tax Credit. Input services are received post payment of tax on output supplies. Due to the above reasons, a lot of input tax credit is lost by the service providers or remains blocked for a long period. 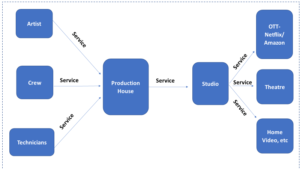 In a co-production model, typically, Production house and Studio enter into an agreement, whereby the Studio has the role of financing and production house has a role of carrying out production activities. Typically, studio retains the exploitation rights of the film and both parties as partners in the venture share all IP, derivative rights and profits as per pre-defined terms. There is no assignment of rights for consideration from Production House to Studio or vice versa. 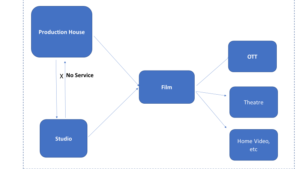 In the above scenario, there are interpretational issues as to whether the said transaction would constitute a service between the Production House to Studio. It must also be noted here that even in case of such a scenario, it is not that no tax at all is payable. Even in such case, further distribution of rights to any party like Amazon/Netflix, etc. will be liable to applicable GST. Both companies will be assessed collectively as a Joint Venture/ unincorporated association of persons. In such a case, inter se, transaction between Production House and Studio will be ignored and consideration received from sale of rights etc. by the parties will be assessed for GST. However, the agreements and intention between the parties must clearly indicate that the intention is to jointly produce the film and not to provide services to each other. While from GST standpoint, the transaction may be better suited for the companies due to lower cash flow requirement. However, before opting for co-production model, the parties must be mindful of the fact that co-production model may potentially attracted additional income tax liability due to assessment of Income as Association of Persons (AOP). It is advisable that before opting for this position, all pros and cons must be carefully analysed by the parties from the standpoint of both direct as well as indirect taxes. It is to be noted that different GST rates are applicable to different kinds of services. For e.g. GST rate of 18% is applicable for the services rendered for film productions whereas rate of 12% is applicable while the copyrights are transferred and further a rate of 28% is applicable on cinema tickets above Rs.100/-. Thus, it may happen in a number of scenarios that tax of output supplies is less than tax on input goods and services. This results in accumulation of Input Credit in the books of accounts due to non-utilization of credits. Many players in the industry are facing the issue of this accumulation of credit due to inverted tax structure and would want to understand if there is any mechanism under GST, whereby this accumulated Input tax credit can be refunded. Here, it may be noted that as per the relevant provisions of the GST, a registered person is entitled to claim refund of unutilised input credit where the credit has accumulated on account of rate of tax on ‘inputs’ is higher than the rate of tax on outward supplies. However, important thing to note here is that GST provisions only provide for refund of Input tax credit in case of accumulation of credit due to higher rate of tax on inputs i.e. ‘input goods’. However, the same mechanism is not provided for accumulated credit of tax in case rate of tax is higher on ‘input services’. In absence of any specific provisions relating to refund of input tax credit in such situations, the industry is losing the valuable Input tax credit and may continue to suffer. As noted above, GST provisions prescribe that any activity done for a consideration is liable to GST. Thus, it is beyond doubt that the services provided by Studio to Production House will be liable for GST. However, valuation of services for the purpose of taxation would be a problem in the present case. As per the relevant provisions, both monetary consideration as well as non-monetary consideration must be included for paying tax. 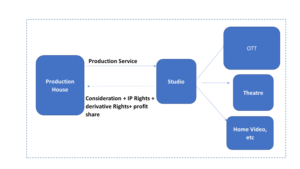 The tax authorities may argue that IP Rights and derivative rights offered by the Production House becomes a consideration for services and would demand GST by including the value of such IP and derivative rights in the consideration received by production house from the studio. Also, important to note here that GST paid by the Production House on this transaction will be available as Input Tax Credit to the Studio, which can be set off against further tax liability arising at the time of distribution of film rights to OTT- Netflix, Amazon, Satellite broadcasters, theatres, etc. In another common scenario, a Studio in India does production activities through an overseas entity, for e.g. a UK entity. After the production of the film, the rights relating to the said film (i.e. IP Rights, Distribution Rights and other derivative rights )are transferred to the Indian entity. Since the rights are transferred by the UK entity to the Indian entity in lieu of consideration, the UK entity becomes the service provider and the Indian entity is recipient of services. While GST is only applicable within the territory of India, however as per the relevant provisions of GST, it is also chargeable in case any services are imported in India. Import of services occur where the supplier is located outside India and the recipient is located in India. Consequently, the said transaction is liable to GST. Normally, GST liability is to be discharged by the provider of services, however in case of import of services, the recipient i.e. the Indian entity is required to discharge GST. Please note that in a reverse situation i.e. if an Indian entity is providing services to a foreign entity, GST will not be payable since it would amount to export of service, which is not taxable. However, the consideration in such a scenario must be received in foreign currency. Although there may be some issues regarding implementation of GST in both parts of discussed, it must be noted by the readers that imposition of any tax is never pleasant for its subjects. Some of the complications regarding GST are present in other developed economies, where GST is in force for years. GST law is still at its nascent stage and the industry can be hopeful that with time improvements will be made to smoothen the process of taxation. Next articleCOPYRIGHT AMENDMENT ACT, 2012 TURNS SIX!